Does Reese Witherspoon ever sleep? Last we reported, the actor and producer was working on a staggering nine projects simultaneously, including collaborating with Crate & Barrel on her fashion and home decor line, Draper James. The ongoing partnership with Crate & Barrel was announced in October 2017, and over one year and countless dining and entertaining products later, Draper James has finally launched bedding essentials, like duvet covers, pillow shams and sheets. 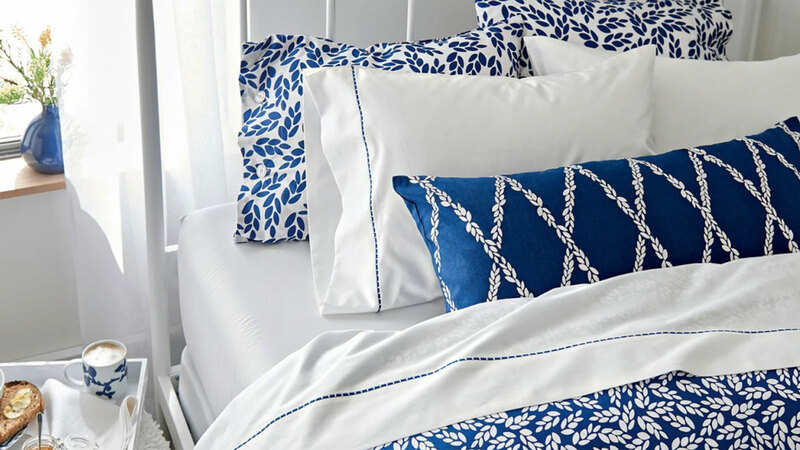 Called the Willow Collection, it includes beautiful blue-and-white bedding sets, and shoppers can choose from solid sheets and shams and elegant leaf-pattern and trellis-motif prints. The detailing is sophisticated too; specifically, the 300-thread-count duvet cover closes with pearlized buttons. “Draper James is a Southern-inspired lifestyle brand that embodies the personal style and sensibility of its founder and creative director,” Crate & Barrel writes on its website. Witherspoon, on the other hand, simply describes it as the “prettiest bedding you’ll love to tuck into every night” — and she isn’t wrong. The bedding collection is affordable too. Prices range from $36 for sheet sets to $160 for both duvet covers and pillow shams. All of the items are on sale on Crate & Barrel’s website, with prices slashed by about $10, so don’t wait to get your hands on this collection.